We just put the wraps on the season and it certainly went out with a crescendo. First off, 12 of our buddies from the centre of the universe (that’s Toronto you dunderheads!) arrived at the lodge. Showing off our mountain home to life long friends is one of the great joys of running Selkirk. Many of the boys had joined me at another cat ski operation before I bought SWS/Selkirk Snowcat Skiing, and the endless comparisons and effusive compliments were music to my ears. To everyone’s delight, Mother Nature finally cooperated bringing with her colder temps and lots of fresh snow. Face shots, epic crashes, big mountain lines and cheese eating grins were the order of the week. The other big event last week was a first ever! My sis, Karen, has MS and when her balance became compromised she thought she’d have to give up skiing. She recently took up sit skiing and dreamed one day she’d ski in a big mountain environment. Her inspiration being Josh Dueck, a Paralympic, World, and X-Games champion, with a “can do” attitude and perma-grin to match. 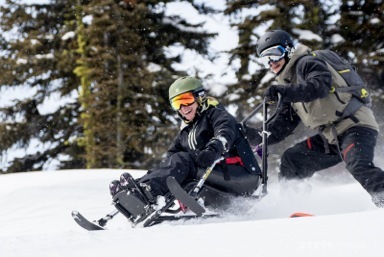 She had never met Josh, but that didn’t deter us from inviting Josh and his crew to attempt the first ever skier assisted sit ski in the back country. Kevin “Line Swine” Marr recorded another first by recreating the Powder 8 scene from Aspen Extreme when he dropped in after Josh to figure 8 an entire line while everyone just oinked their displeasure! The smiles on the faces of Karen and Josh were only rivalled by those from our amazing team at SWS who made it all possible. What a fantastic way to end an unbelievable season on Meadow Mountain. Happy 40th Selkirk, and here’s looking forward to next year! !